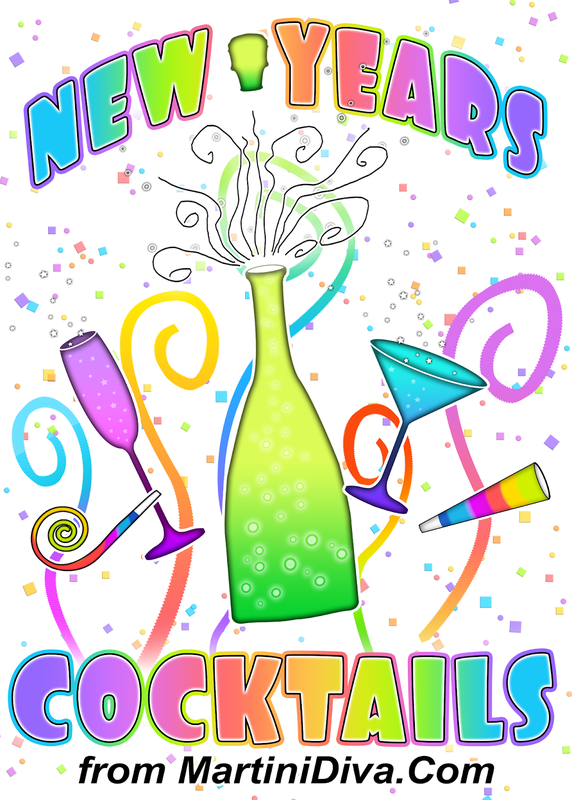 New promise it's bringing, So lift up your glasses As the old year passes, And greet the New Year, With toasts of Good Cheer! 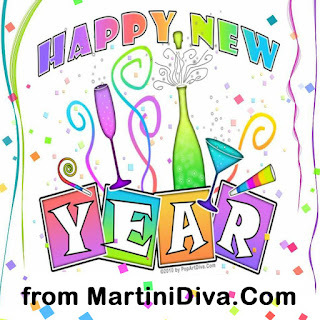 NEW YEAR'S COCKTAILS BLOODY MARY'S BLUSHING ROSE BUBBLING FRUIT BRANDY MARTINIS CHAMPAGNE COCKTAILS CHAMPAGNE WISHES & CAVIAR DREAMS GRILLED PEACH MIMOSA MERRY MIMOSA MARTINI MIMOSAS NEW YEAR'S BLUES MARTINI NEW YEAR'S RESOLUTION MARTINI PRICKLY PEAR CHAMPAGNE COCKTAIL RASPBERRY RESOLUTION MARTINI SPARKLING GRAPE MARTINI SPARKLING HIBISCUS MARTINI SPARKLING PEAR MARTINI SPARKLING POMEGRANATE MARTINI TWILIGHT PEARL MARTINI Here's to a new year filled with cheer! You could always tell when my Grandma Effie's "tea" had a kick, you could hear the ice cubes clinking around her china cup as she sipped. I kinda always wanted to try that tea, it sure made Grandma happy, but Mom said it was grown-up tea and always shoved something less potent towards me. Well, I'm all grown up now, Mom. 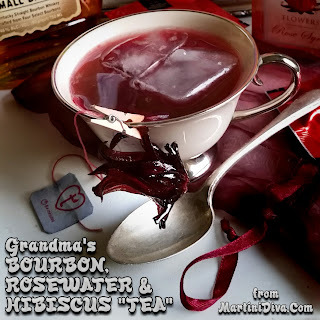 Grandma's BOURBON, HIBISCUS and ROSEWATER "TEA"
DIRECTIONS: Brew the Hibiscus Tea, strong, and allow to cool. Add the ingredients to a cocktail shaker and shake and until chilled. 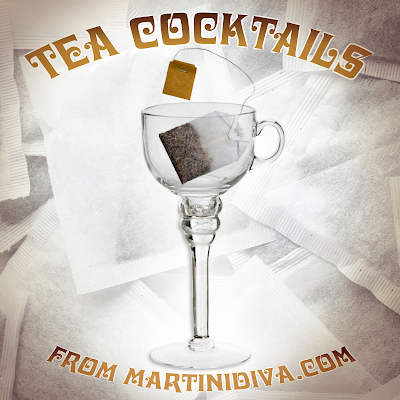 Strain into a teacup with a few ice cubes in it, garnish and serve. 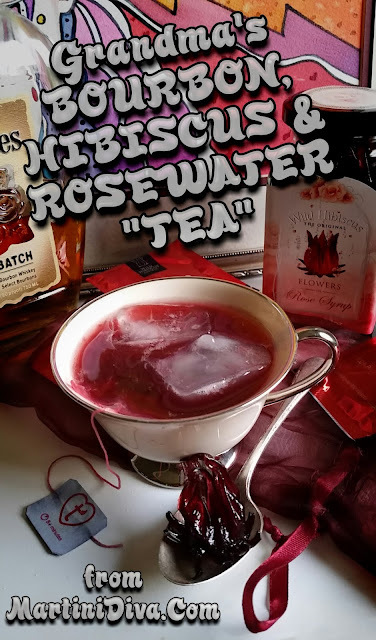 Grandma's tea was usually just orange pekoe with a couple of fingers of bourbon, so why the rose and hibiscus? Because my grandma always smelled like rosewater, and the wallpaper in her house had giant hibiscus flowers all over it. MAKES A GREAT HOT TODDY TOO Yes, you can do this hot, it just happened to be an 80 degree day in December here in Tucson when I made this, I wasn't going with a hot toddy! Just don't cool the tea and leave out shaking and straining, which is primarily to strain out any ice shards anyway. 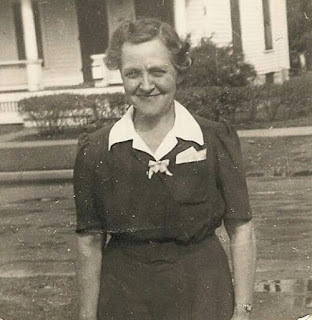 Cheers to you, Grandma Effie, I sure hope there's bourbon up there! 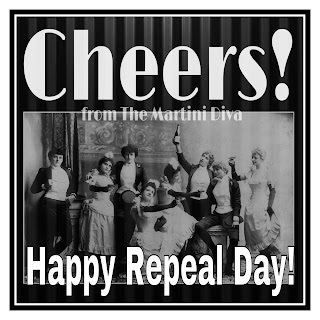 Long before I ever called myself The Martini Diva I was adding booze to my tea. One of my favorite combinations was Grand Marnier in Good Earth's spiced orange tea. 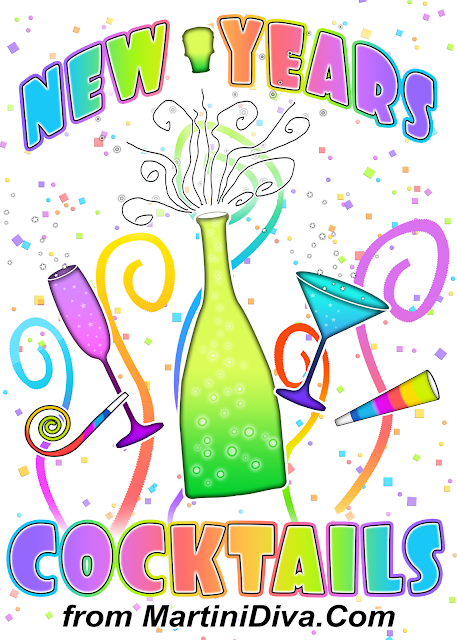 I was also fond of flavored vodkas and rums with flavored teas, both iced and hot. I've even made tea infused vodkas by simply dropping 6 to 8 tea bags into one bottle of decent vodka. You allow this to steep for about 18 hours, strain through coffee filters (just to get the fine tea dust out) and you're ready to go. If you want Sweet Tea Vodka simply add simple syrup to taste. You can also add spices, herbs and citrus zest as well as berries and fruits though you'll need to infuse those longer depending on what you've added. Tea is a great way to add a little creativity to your craft cocktails. You can make a tea infused simple syrup to use in your tea or use it as a cocktail mixer, either hot as a toddy or mixed cold. There's a world of possibilities considering all the flavored teas out there. And it's always fun to serve a cocktail in a teacup, that's how my Granny used to have a nip of bourbon in her tea. International Tea Day is December 15th, Iced Tea Day is June 10th, British National Tea Day and National Tea Day are both April 21st, National Hot Tea Day is January 12th and January is National Hot Tea Month. Lately it seems like gingerbread is surpassing pumpkin for the latest trending holiday flavor profile. I don't have a problem with that because I love gingerbread, and have created many Gingerbread Cocktails for past Christmas seasons. 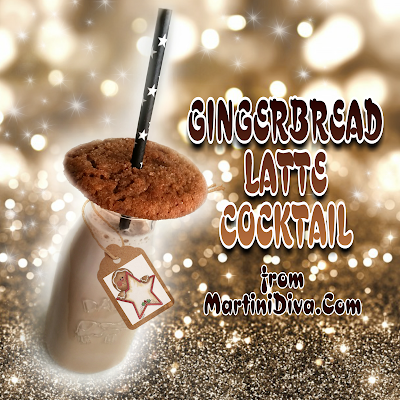 I also love Coffee Cocktails and often pour a little of my Homemade Gingerbread Liqueur* into my evening cup of coffee for a quick coffee gingerbread tipple. 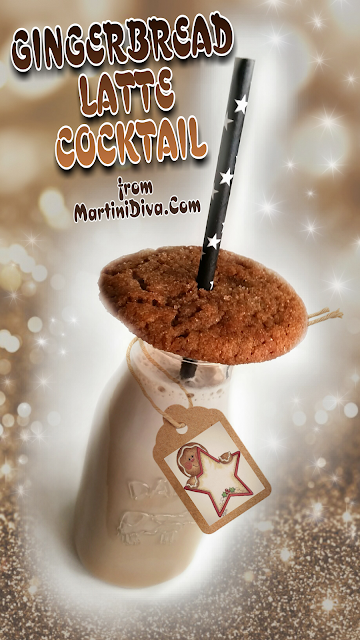 Why I neglected to make an "official" coffee and gingerbread cocktail until now eludes me, but this drink recipe should solve that issue once and for all. Chill glass in the freezer. Shake the ingredients with ice in a cocktail shaker until chilled then strain into the chilled glass. National Gingerbread Latte Day it is December 15th. 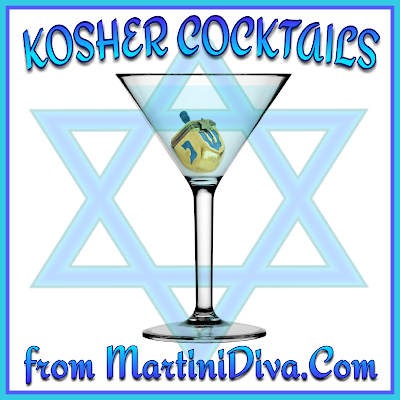 Yes, Kosher Cocktails. What, you think there's no drinking in the Hebrew culture? Well, think again. 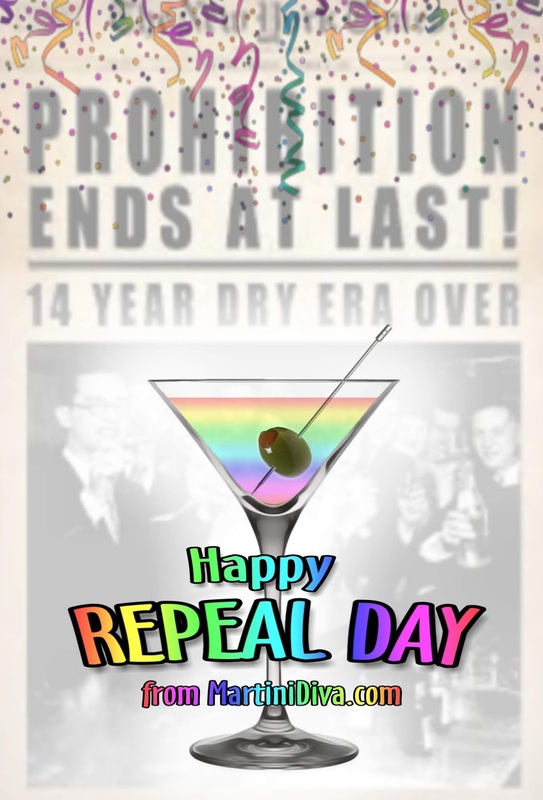 My Jewish friends love a good cocktail and, for those who follow the laws of kashrut (keep kosher) I always try to include a kosher drink in my party bar menu. I may be a shiksa but I am also a good hostess who prefers every guest of mine be accommodated. Because I'm a shiksa though, my kitchen is not kosher so, technically speaking, the actual cocktails I serve in my home might not be for strict Orthodox practitioners. My Hebrew friends are not Orthodox so I'm able to mix up some cheer for them during their High Holidays and on Shabbat. 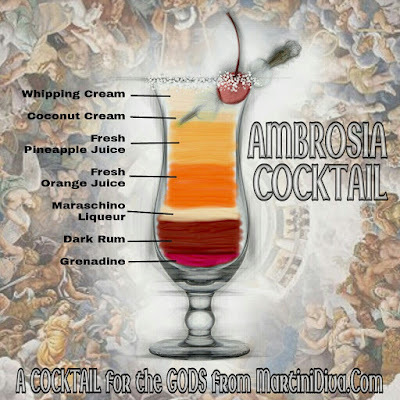 Here's a perfect cocktail for cold weather and the holiday season. 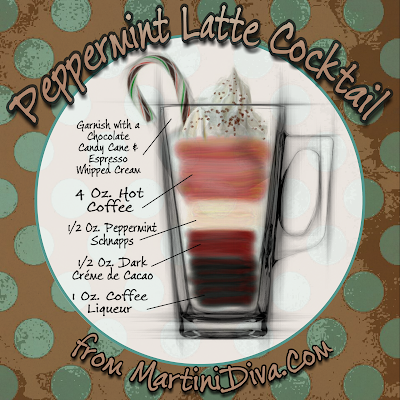 It's got all your winter favorites in one glass; hot coffee, chocolate and peppermint plus, yay, booze! Merry, Merry whatever holiday you celebrate at this time of year. DIRECTIONS Add the ingredients to a coffee mug, stir, garnish and serve. * My recipe for the Espresso Whipped Cream can be found on this Fernet Mocha Frappé Shake Cocktail. 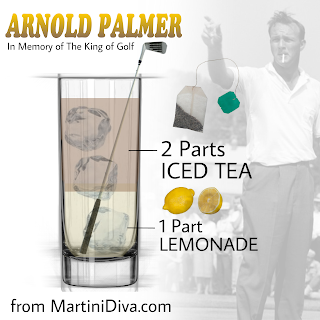 Yes, you can make it a cold cocktail too. Just shake the ingredients with ice in a cocktail shaker, strain, garnish and serve in an Old Fashioned glass instead of a mug. National Peppermint Latte Day is December 3rd. There's something about late fall that makes me want caramel apples. Maybe it's because my mother used to make caramel apples for the Trick or Treaters every year. I also happen to love caramel apples so when fall creeps around the corner my cocktail fancy often turns to this childhood favorite. 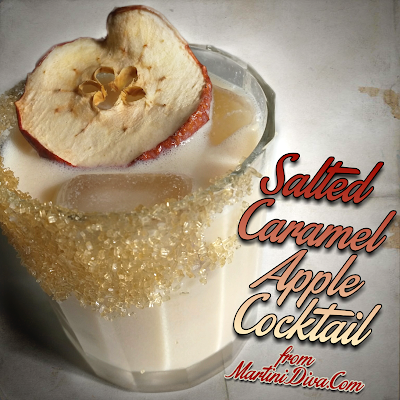 Ages ago I created a Caramel Apple Martini, long before there were caramel, apple or salted caramel vodkas on the market. 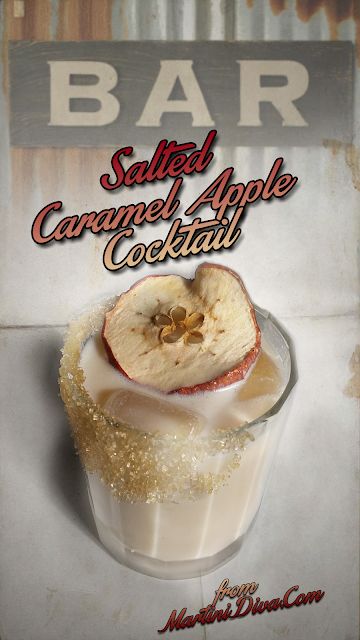 When I discovered I had tucked a bottle of Smirnoff Kissed Caramel Vodka on my bar shelf and forgotten about it, I decided maybe I'd try a new recipe. The new recipe turned out great. It's absolutely perfect for a dessert drink! DIRECTIONS Rim then chill glass in the freezer. Add ingredients to the cocktail shaker and shake until chilled. Strain into the chilled glass, garnish and serve.